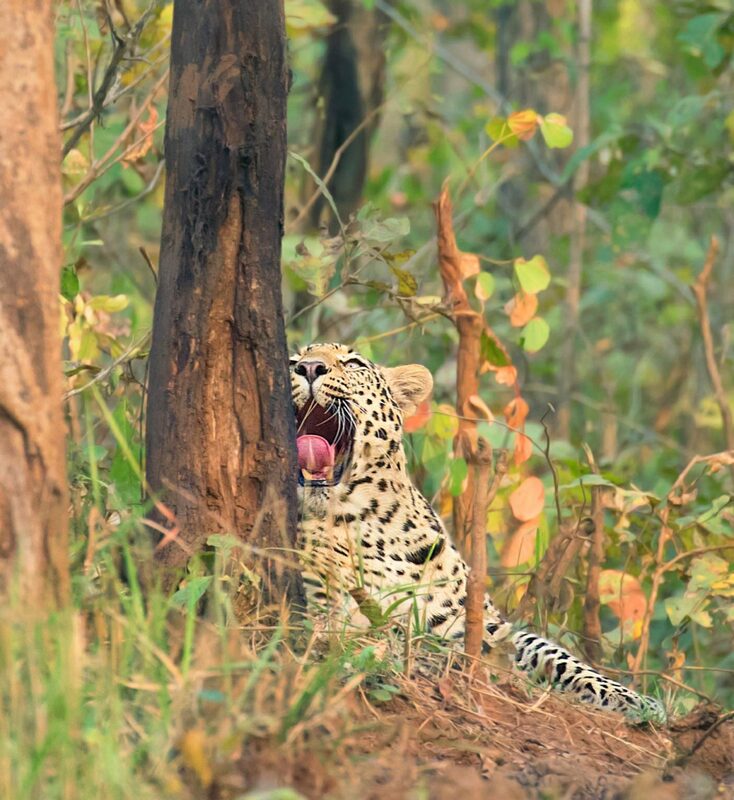 Widely distributed on the Indian subcontinent, the leopard or Panthera pardus is categorized as vulnerable in the IUCN list. Come join us as the author recounts his chance encounter with this spotted feline. It was a trip planned all of a sudden, just in a couple of hours before departure. I paid a visit to Nagzira wildlife sanctuary with few of my friends from Pune. We were lucky to get permits on the spot as there was no rush due to dry sightings. But this visit turned out to be an unforgettable and astonishing experience for all of us. We just couldn’t believe with our eyes! A young leopard was approaching head-on towards us, right from the safari trail! The whole incident took place right in front of the main gate of Nagzira wildlife sanctuary i.e. at Pitezari gate itself. We hadn’t even started our safari and were lucky enough to see the leopard coming towards the gate. We managed to take some photos on foot before we started our safari! The people who didn’t get the permits that day were very fortunate to witness this sighting without taking a safari. A huge crowd had gathered on the gate and eventually, the leopard sat on trail for few minutes and went inside the bushes. On our second safari, we changed a strategy. All safari cars were lined up along the main gate to see the leopard as the news about this latest sighting had spread all over. We decided to visit a remote area in the sanctuary where the sighting had been absolutely dry and hence no one visited this area. And this decision turned out to be a jackpot! We came across a waterhole and got to see a huge male leopard sitting there. We were the only ones fortunate enough to witness this sighting. Thanks to our guide for his skill, knowledge and hawkeye sighting of the spotted feline. Yes! This time a close encounter for photography was possible. Thinking back, I can surmise that rushing all the cars simultaneously through the gate might not be favorable to the chances of a sighting. Rather, a different strategy, an out-of-the-box thought process and willingness to take a risk to venture in an area known to be dry for sighting might suddenly up the chances for an encounter with the spotted kind. I am a passionate wildlife photographer from Pune, India and am into the wildlife photography for more than five years. I started my career in wildlife photography with a point and shoot camera before upgrading to SLR camera. I have done Masters in Computer application as my educational background. I always like clicking birds and animals in nature and showcase this collection to people from India and rest of the world and let everyone know what beauties exist in nature. I always like to convey the readers through my photography how I see nature from my point of view. Once I was standing near my house observing a spider hanging on a web. Suddenly a bird came flying from nowhere and ate the spider while hovering. So the thought came to my mind that there are so many natural activities happening around us but we never tend to look at them. And that is where my interest in wildlife photography started and a strong fascination for nature and wildlife. I am currently acting as a contributor to my wildlife materials onto the national and international platform. As of now much of my wildlife collection has been published in renowned magazines, newspapers, competitions and online websites.